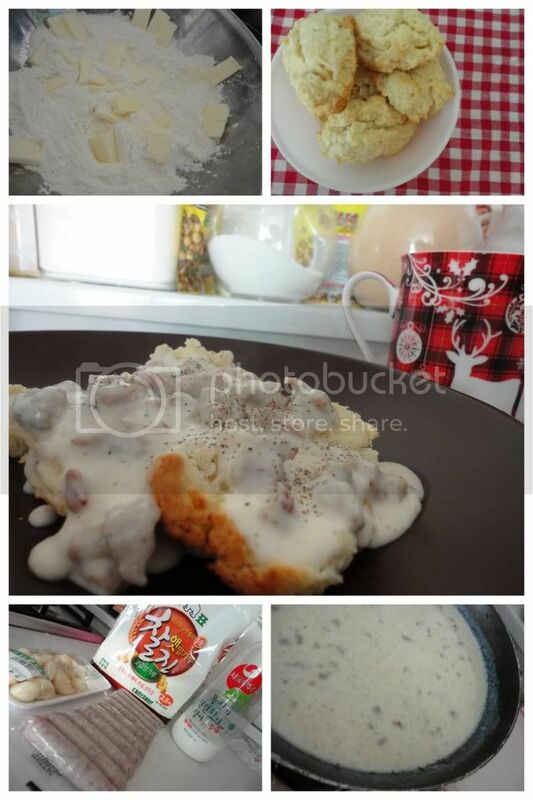 519 Kitchen: Biscuits and Gravy -- Hallelujah! It finally happened. And it happened multiple times. And it's happening as leftovers. Praise the Lord! I love Biscuits and Gravy! Heat 1-2 Tbsp. of oil in a large skillet. Brown about 12 links (out of their casings) of sausage or the equivalent (I recently just used ground pork which required a bit more oil but filled the craving regardless). Once cooked through, throw 1-2 minced garlic cloves into the pan and saute until fragrant. Add 2-3 Tbsp. of Flour to soak up the oil/grease. Time to gradually add in some milk, probably 1.5 - 2 cups. Heat on the stove top 10-15 minutes until thickened. (I get impatient and occassionally add another Tbsp. of flour...you can too if you want, I won't tell). Meanwhile, mix two cups of flour with 1 Tsp. Sugar, 1 Tbsp. Baking Powder and 1 tsp. Salt. Cut in 8 Tbsp. Butter with a fork or pastry blender. Make a well of the crumbly mixture and add 3/4 cups of Milk. Knead the dough, drop or roll out and cut with a biscuit cutter or top of a glass, place on a baking sheet and bake at 350 for about 10-15 minutes. Smother those biscuits with gravy and you will be lovin' life!